Leslie A Viereck and Elbert L. Little, Jr. 1972. Alaska Trees and Shrubs, Agriculture Handbook No.410. Forest Service, United States Department of Agriculture. Washington, D. C. Reprinted in 1986 (without the Vegetation Map of Alaska) by the University of Alaska Press, Fairbanks, Alaska. Sixth printing in 2000. Paperback. 265 pages. 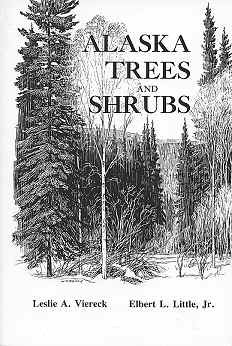 This guide includes many excellent black and white line drawings (no photographs), distribution maps, descriptions of Alaskan habitats with characteristic species, taxonomic keys for all species of Alaskan trees ,shrubs, and shrubby plants such as rose, blueberry, heathers and others. Very informative and easy to use, the authors have included many detailed descriptions of plant habits, habitat, uses and name derivations.